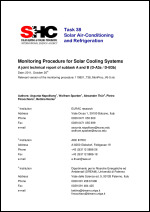 Monitoring of installed solar assisted cooling systems represents a fundamental tool in order not only to optimize the monitored system itself, but as well to draw conclusions for a suited selection of design and control for future installations. This is especially true for a technology in an early stage of market penetration, as it is the case for Solar Heating and Cooling (SHC) systems. In fact to the date, only around 300 SHC are documented worldwide. 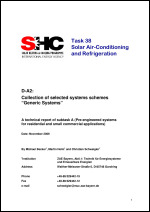 This report summarizes the monitoring activities on small-scale solar heating and cooling systems carried out within subtask A of IEA-SHC Task 38. 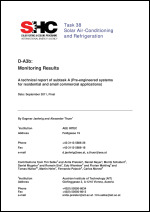 All systems were monitored according to the monitoring procedure developed with Task 38. However, the level of detail varies from system to system. The monthly monitoring data has been filled into the Monitoring Excel Tool of Task 38. The idea of this working group was to set up guidelines for installation, operation and maintenance based on experience of already existing pre-engineered small scale solar heating and cooling plants. Therefore, an end-user survey was invented by setting up a questionnaire including the relevant information for this purpose (see chapter 2.1). From the results of the interviews (see 2.2) it became clear that most of the analyzed solar heating and cooling plants can´t be categorized in “pre-engineered” systems. 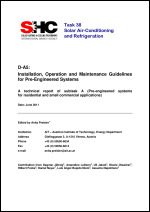 As a result it was decided in the working group that the information gained from the end-user survey should be used for a list of recommendations (see chapter 2.3) to bring the idea of pre-engineered systems forward. Systems for solar heating and cooling with a cooling capacity below 20 kW should be as much pre-engineered as possible. That means that the entire system layout and the size of all components is pre-defined by the manufacturer or seller of the system. To install such a system there is no detailed planning process necessary. It can be bought “off the shelf” designed for a given heating and cooling load and can be installed by an HVAC installer. Unfortunately, only few companies offer this kind of pre-engineered system up to now. For wide-spread application of solar cooling, compact systems shall be installed by professionals from the heating and plumbing sector without requiring a detailed planning procedure on a case-by-case basis. Thus along with the required equipment – i.e. thermally driven chiller, solar thermal system, and heat rejection device - well-proven system configurations have to be available for selecting an appropriate system concept with regard to the given specific requirements.